Based on the age-old Ayurvedic formulation called Swarn, the Soundarya Radiance Cream uses the power of pure 24-Karat Gold to work its revitalizing magic on your skin. Gold is a metal that easily absorbs into the skin, protecting it from the sun and environmental damage, improving its elasticity and working as an extremely powerful age-defying agent. This extra rich rejuvenating day cream with its nourishing blend of herbs and oils provides a natural facelift, firming and toning the skin. Active ingredients like Cold pressed natural vegetable oils deeply moisturize and nourish the skin, while Cowﾒs Milk improves elasticity and firmness. Renowned Ayurvedic herbs like Liquorice, Vansh, Ashwagandha and Turmeric form an intrinsic part of this Ayurvedic formulation, provide excellent antioxidant properties helping to combat free radicals. The combination of Ketki, Saffron and 24 Karat Gold Bhasma firms underlying muscles to tone the skin, and helps in controlling collagen depletion, increases skin elasticity and smoothes fine lines. Yasada Bhasam (Zinc Oxide) forms a physical barrier, reflecting UV radiation and protects the skin against the detrimental effects of UV light. 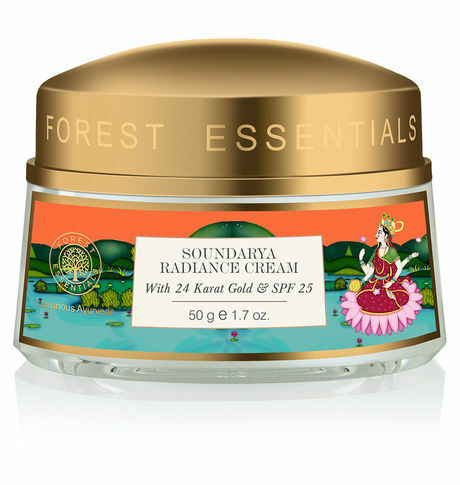 The Soundarya Radiance Cream has been designed to leave you with a toned, supple and radiant skin. -Regular use shows visible results within 2 to 3 weeks.